Paisley’s flagship annual cultural extravaganza The Spree gets under way today….helped by National Theatre of Scotland offering a truckload of chances to see the area as never before. The seventh year of the Spree (12 to 21 Oct) sees 87 shows in 17 venues in five towns around Renfrewshire over ten days – with music, comedy, theatre and much more. Big-name headliners include Black Sabbath guitarist Tony Iommi in conversation about his legendary career (Fri 12 Oct) and Martha Reeves and the Vandellas and the London African Gospel Choir performing Graceland (Sat 20 Oct), both at Paisley Town Hall. The iconic Spiegeltent in County Square will host musical acts The Orb (Mon 15th), Tracyanne and Danny and The Pastels (Sat 13th), ex-Kraftwerk man Wolfgang Flur (Sat 13th), The Wandering Hearts (Sun 14th), Vieux Farka Toure (Tues 16th), The Leisure Society and Duke Special (Weds 17th), Big Minds (Thurs 18th), and Gang of Four (Fri 19th). The festival also includes Rimini Protokoll and National Theatre of Scotland’s Do’s and Don’ts (12-14 and 16-21 Oct) – offering a unique experience touring the area in a mobile auditorium inside a remodelled truck, backed by the soundtrack of a local choir. The show is presented by award-winning German documentary theatre specialists Rimini Protokoll and is part of NTS’s Futureproof festival, marking Scotland’s Year of Young People 2018, and some of the young cast were on hand to help launch the festival yesterday outside Paisley Town Hall. Other Spree highlights over the next 10 days include a sold-out comedy show with Des Clarke and Janey Godley (Spiegeltent Fri 12th), Aidan Moffat and RM Hubbert (Paisley Arts Centre, Sat 20th), the ModStuff festival-within-a-festival (Spiegeltent, Sat 20th) plus a visit from The National Whiskey Festival (Paisley Town Hall, Sat 13th). Do’s and Don’ts is part of The Wee Spree programme over the October school holiday – with a list of (mostly free) shows for kids offering everything from comedy to ceilidhs, plus video game design, circus skills workshops and a dancealong to The Greatest Showman. There’s also the Spree for All fringe festival, which includes the daily Danny Kyle Stage for unsigned acts in the Old Swan Inn, and taking top local musical talent to venues in Johnstone, Renfrew, Linwood and Lochwinnoch, as well as the pubs and clubs of Paisley town centre. The Spree is run by Renfrewshire Council as part of a major events programme also including Paisley Halloween Festival (Sat 27 Oct) – listed as one of the top Halloween events in the UK. The council’s head of communications, marketing and events Louisa Mahon said: “This year’s Spree will be the biggest and best yet as our events continue to grow and attract more visitors to the area. “The bill has something for everyone – from world-renowned musical talent to a diverse programme for kids of all ages, to some of the best local acts at a venue near you. 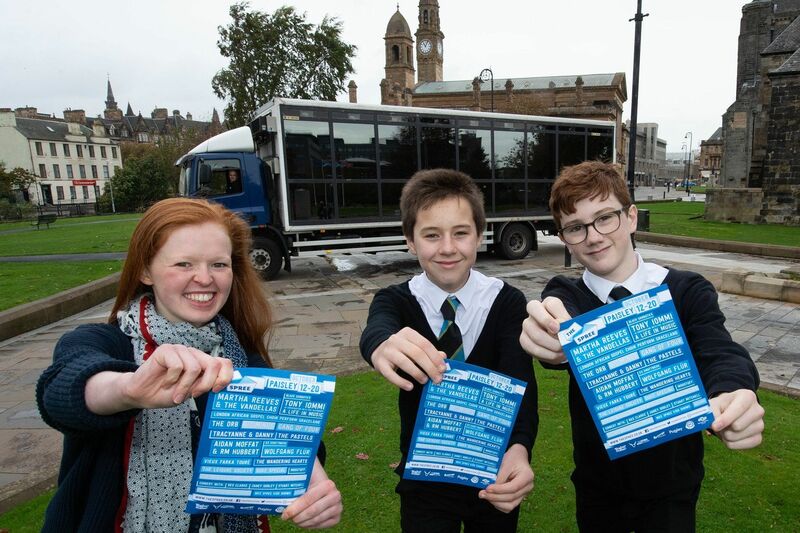 Jackie Wylie, Artistic Director and Chief Executive of the National Theatre of Scotland, said: “DO’S & DON’TS has been co-created by the young people of Paisley as part of our Futureproof festival, marking the Year of Young People 2018, and I am delighted that it is part of the Spree programme.